The Institute of Hotel Management, Shimla, is situated amidst quiet, lush green surroundings with a picturesque view of the Himalayan Range. The old- world air of the times of the British Raj lends a quaint charm to the site. Located on the NH22, at Kufri, it is at just the right distance from the hustle and bustle of Shimla and is easily accessible by road. The tranquility of the location is ideal for providing an academic ambience for the serious learner. The Institute has a Placement Cell, very ably managed by experienced faculty, which assists the students in arranging for Placement in leading hotels and allied service sectors. Apart from the tourism- related sectors, students also get absorbed in customer service- oriented organisations. Prestigious hotels and service organisations visit the Institute and hold campus interviews for the placement of our students. Institute of Hotel Management IHM, Shimla offers various graduate courses as well as Post Graduate courses. 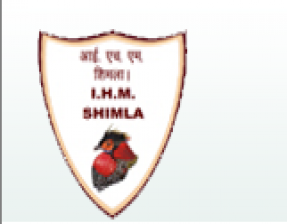 List of facilities available at Institute of Hotel Management IHM, Shimla for students. This page was last modified on 12 November 2015 at 20:11.